Wow! Its hard to believe I haven't posted in over a week but I've been busy enjoying my time at the theater! Now that the show has closed sniff-sniff, hopefully I can back to my routine of creating and sharing what I've made with you. For my card today I used the Penny Black clear stamp set Good Day! Seems like time off hasn't changed my love for critters! I love this Tammy, such a fabulous image and beautiful colouring. Super cute, Tammy! Brings to mind your time at the theatre....climbing ladders and painting sets, no? This is so sweet Tammy!!! WOW is right! So good that you're back now and know you had a great time at the theater! Of course I love this card!!!! CUTE image and fantastic coloring. CUTE! So cute Tammy, love it! What a clever cat...fabulous image and colouring Tammy, and so good to see you back.. He's just too cute Tammy! I love the colours & your awesome colouring! Hope you settle back in to your routine & don't miss the theatre too much! I have missed your cute critters, but I suspected you were having yourself a good old time at the theater. Good to see you, Tammy. This is totally adorable! Too cute for words, Tammy! I this it! 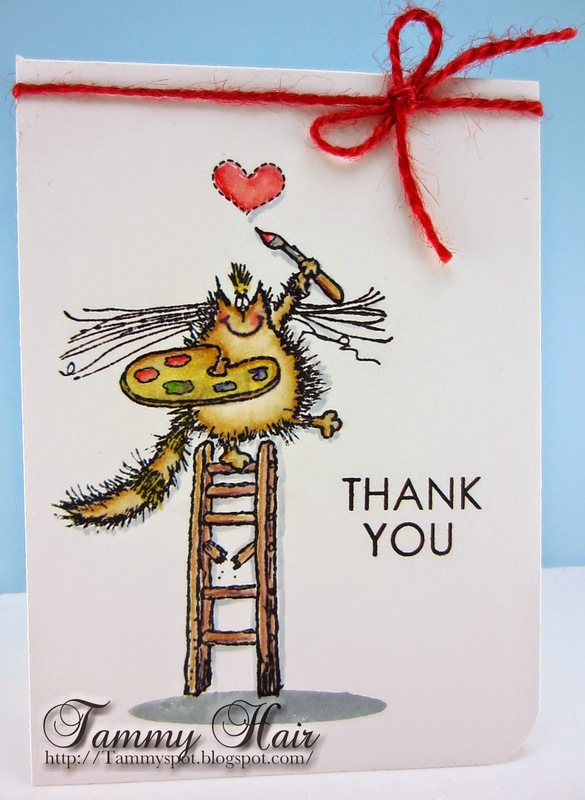 Delightful indeed and Thank You for always making me smile with your art Tammy! Love this! It definitely brought a smile to my face!